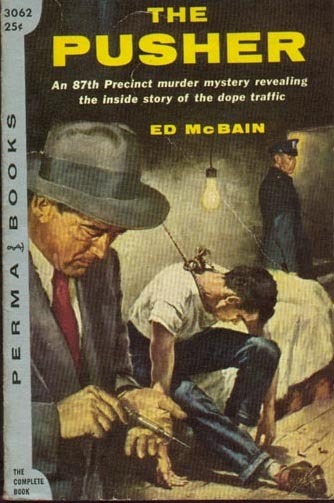 After two good but flawed predecessors, Ed McBain hits a home run with the third novel in the 87th Precinct series, The Pusher. The problem with Cop Hater, the first novel in the series, was that the characters reacted more coldly than human beings would under the circumstances. McBain seems to have grasped that, and The Pusher is much more human. It unsparingly shows the devastating impact of heroin on its users and on the lives of their families, including the family of a prominent member of the 87th. Poor and brown or comfortable and white, no one is spared. Heroin isn’t the only thing creating strains on families in The Pusher, though. McBain also delves into the struggles faced by the wives and children of the men who have chosen the difficult and dangerous profession of policework. The Pusher is a triumph. If you’ve never read an 87th Precinct novel, and aren’t militant about reading series in order, it’s a great place to start.